About this time last year, I learned how to properly cook quinoa, a revelation that not only gave the ancient grain a permanent spot in my pantry, but also inspired a number of grain salads I made all summer long. While the ingredients in each salad varied from radishes and peas to cherry tomatoes and cucumbers to roasted squash and wilted mustard greens, the formula was always the same: something fresh, something crunchy, something spicy, something sweet. The dressing was simple too: extra-virgin olive oil and minced red onions macerated in vinegar or lemon juice. Cheese never entered the equation, nor was it missed. 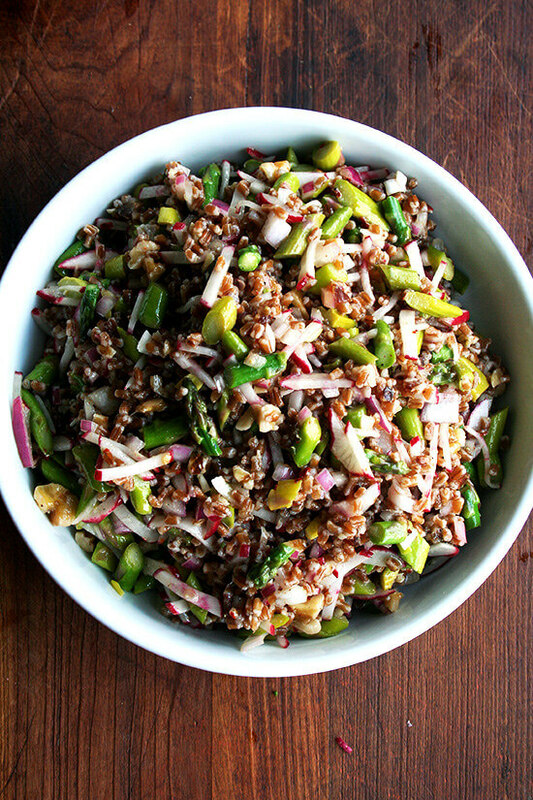 Here, wheat berries and walnuts combine with asparagus and radishes in an addictive, chewy, crunchy, colorful combination, a simple salad to herald the arrival of spring, which at last appears to be here to stay. 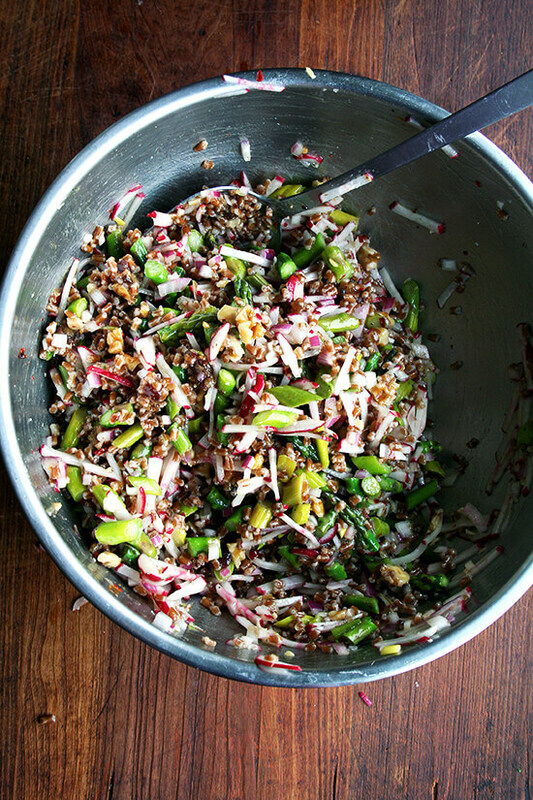 To make a delectable grain salad every time, cook 1 cup grains in heavily salted water; drain and toss with a pinch of kosher salt (as much as a teaspoon depending on the grain/how much you salted the water), 1/3 cup olive oil, 1 minced red onion macerated in 2 tablespoons vinegar, and freshly cracked black pepper to taste; add something crunchy (walnuts, almonds, pistachios, etc. ), something sweet (raisins, currants, dates, etc. ), something hot (minced chili pepper, crushed red pepper flakes, hot sauce, etc. 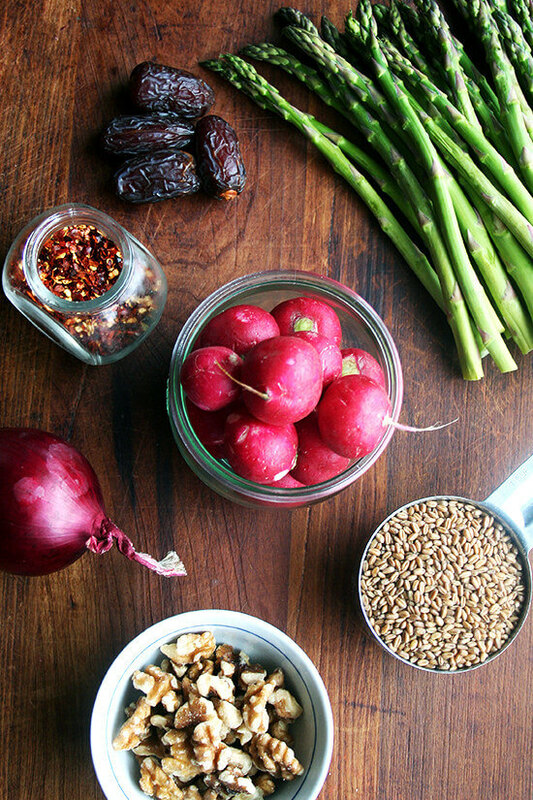 ), and something fresh (radish, asparagus, peas, etc.). Toss. Taste. Adjust with more salt, pepper, vinegar, etc. Toss. Taste. Serve. Bring a large pot of water to a boil. Add a tablespoon of kosher salt. Meanwhile, finely chop the red onion or shallot and place in a small bowl. Cover with 2 tablespoons of white balsamic vinegar — it’s OK if all of the pieces are not submerged. Chop off the end of the asparagus spears. 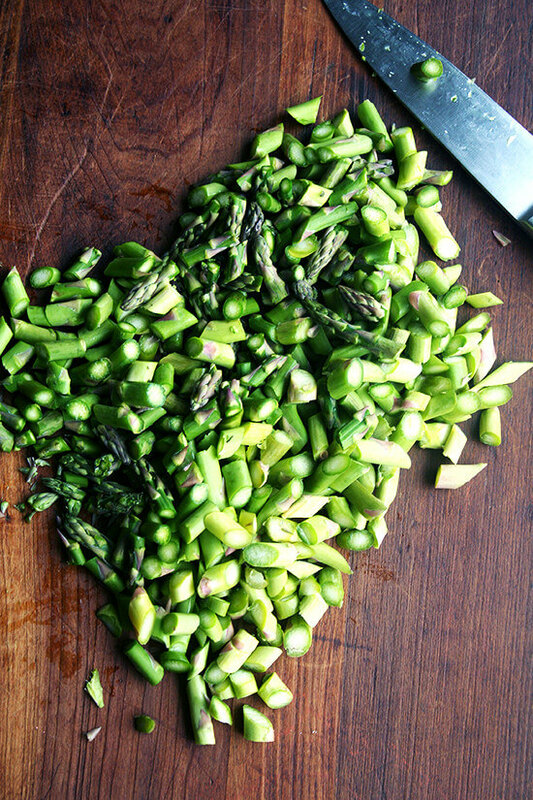 Cut the asparagus on the bias (just for looks) into small pieces — ½-inch to 1-inch in size. 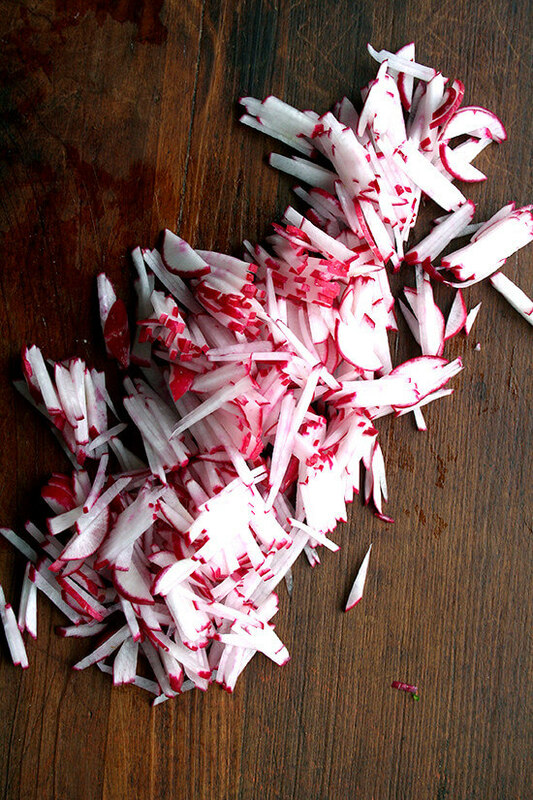 Cut off the ends of each radish. Slice thinly into rounds — a mandoline is a good tool for this. Stack a few slices at a time, then cut straight down to make slivers. Cut the dates into small pieces, set aside. If you feel like toasting the nuts, place walnuts on a sheet pan and cook at 350ºF for 8 to 10 minutes — watch closely to prevent burning. Place the toasted walnuts in a tea towel and rub together to remove papery skin. Transfer walnuts to a sieve and shake again to remove any additional skin. More detailed instructions can be found here. I actually didn’t toast the walnuts this time, and I thought they were delicious. Cook wheat berries according to package instruction. During the last minute of cooking, add the asparagus to the pot and cook one minute further. Note: My package called for 15 minutes of cooking time but it took about 17 minutes or so for the wheat berries to be done. I added the asparagus after the 17 minutes and cooked the wheat berries/asparagus for one minute more — wheat berries are forgiving; they won’t turn to mush like pasta if overcooked by a minute. 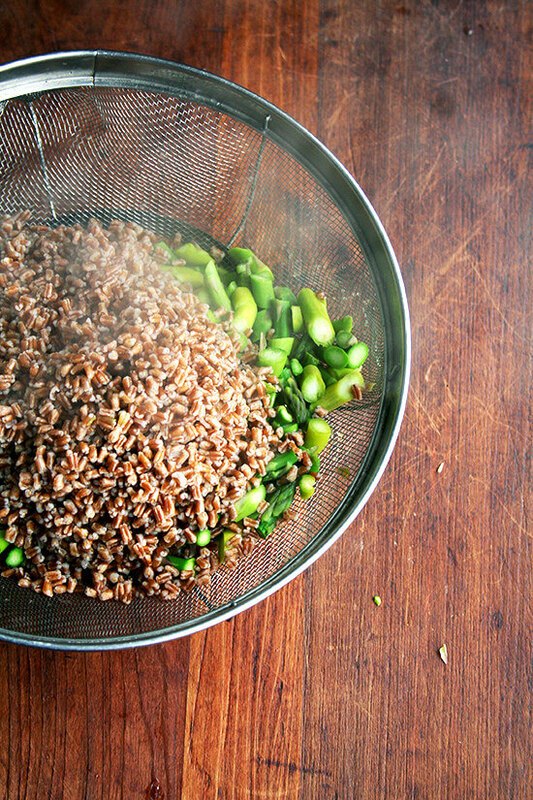 Drain wheat berries and asparagus, transfer to a bowl and season immediately with 1 teaspoon kosher salt (or a little less if you are wary), the olive oil, pepper and crushed red pepper flakes to taste. 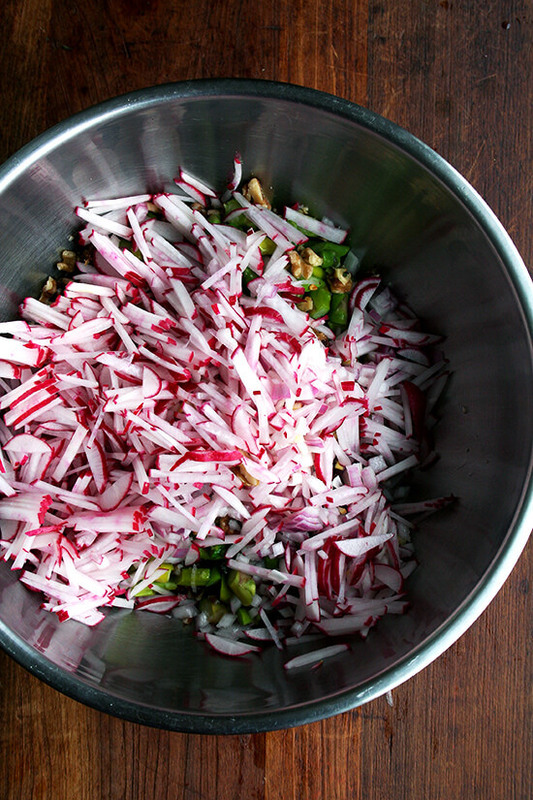 Add the macerated red onions, chopped walnuts, radishes and dates. Toss with a large spoon. Taste. Add another tablespoon of vinegar if necessary and more salt, pepper, and crushed red pepper flakes to taste. Toss. Taste again. Serve. 1. 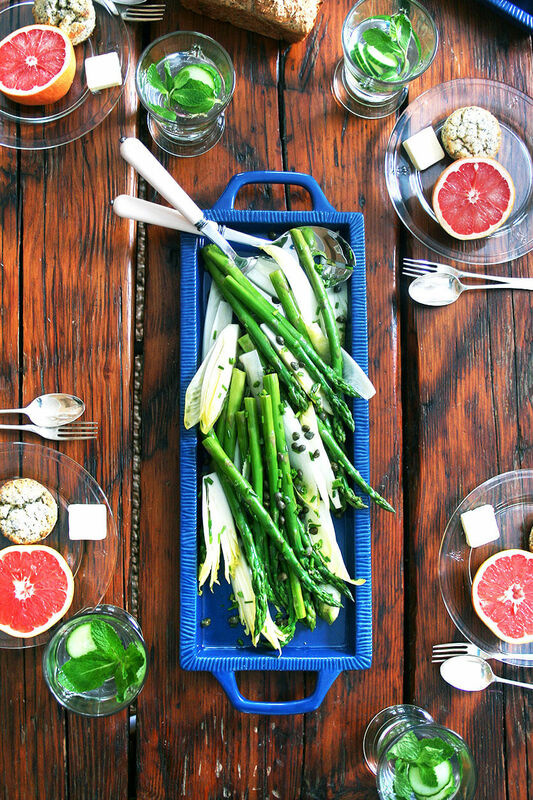 As part of Ballard Design’s How to Decorate series, I shared a recipe for an asparagus-endive salad dressed with lots of chives and capers. The salad is served on this tray with these serving utensils. Lemon-poppyseed scones and grapefruit are served on these bee plates — love these! — and cucumber-mint water in these bee tumblers. Beautiful salad! Love all of those flavors. I think of you every time I cook quinoa. It really was a revelation learning to boil it rather than steam it. Thank you! Gorgeous! All of my favourite spring flavors. Can’t wait for the local asparagus to arrive. Beautiful, love this salad! And love your backbone method to make these tasty grain salads out of nearly anything 🙂 So glad spring is here! 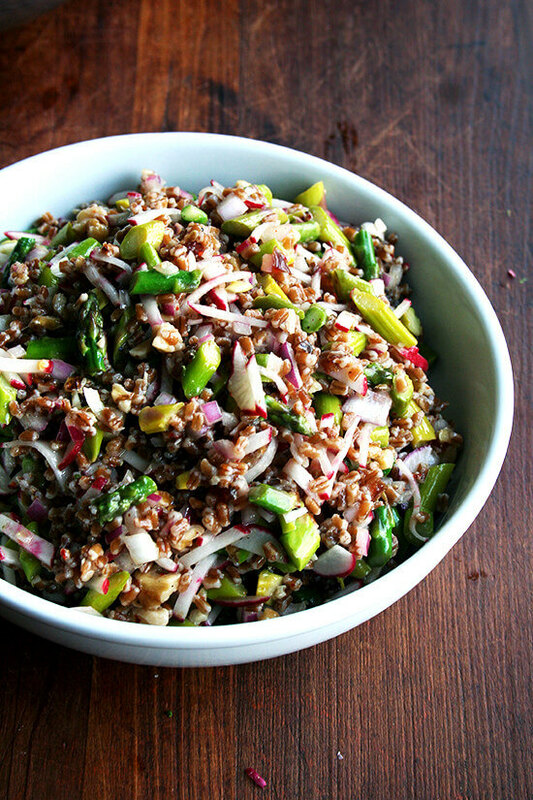 I remember your corn, pepper and farro salad — boy we ate a lot of that last summer! Wonderful to hear this, Sophie! Going on my Easter menu! Looks divine! Looks so fresh and crisp. I have farro on hand. Will try this weekend. Thanks! I really like this. I must admit that I am not a huge fan of radishes, but I might give them another try in this dish. Thank you! Esther, just leave them out! I’ve added them here because so many people start getting them this time of year in their CSAs or at farmers’ markets, but they are totally unnecessary. Cucumbers would be really nice here. This is my kind of salad, love everything about this. Gorgeous pics! It’s still so cold out, I wish I could get it in the mood for spring vegetables! 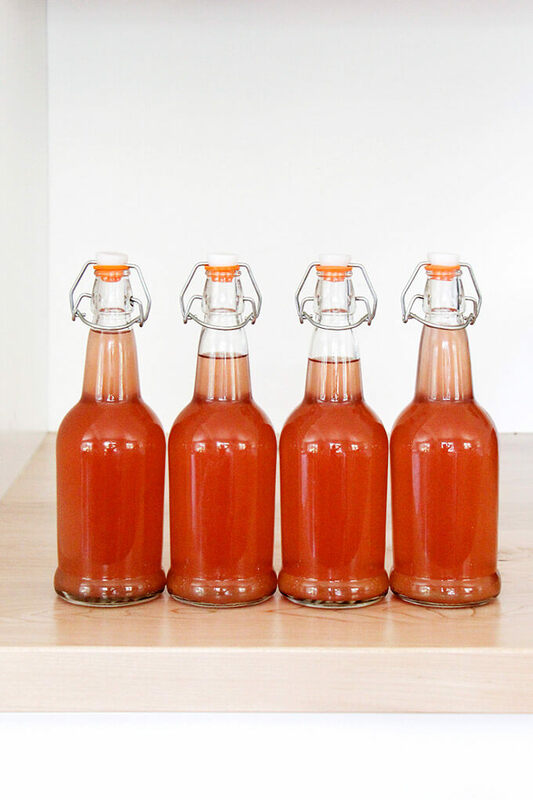 I’m pinning now to save for warmer days! I am eating this salad as I sit here and type as I couldn’t wait to express my thanks for this recipe. I threw a variation on this salad together before work this morning and by lunch time, it was even better than when I tasted it before I dashed out the door. I love the way all the ingredients are holding up (no sad, limp lettuce here – no sir!) and I love the versatility and thew ay you so kindly provided a “backbone” for tweaks. I happened to use spelt, shelling peas instead of asparagus, and added some diced cucumber to the mix. Perfection. I can see this as a regular player in my lunch time regime. Thanks! I am so happy to hear this, Kayla! 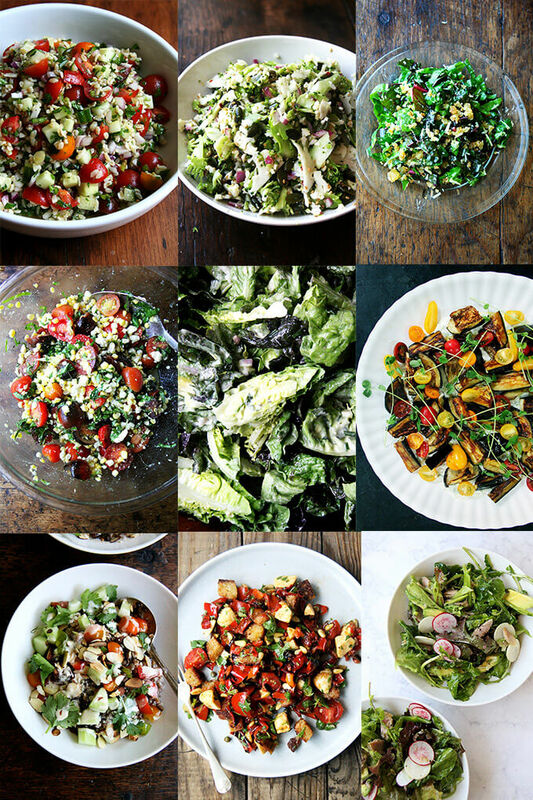 These salads definitely get better as they sit — I mixed mine up in the morning, left it at room temperature all day, and then brought it to a party that evening — everyone gobbled it up. The ingredients do hold up remarkably well. 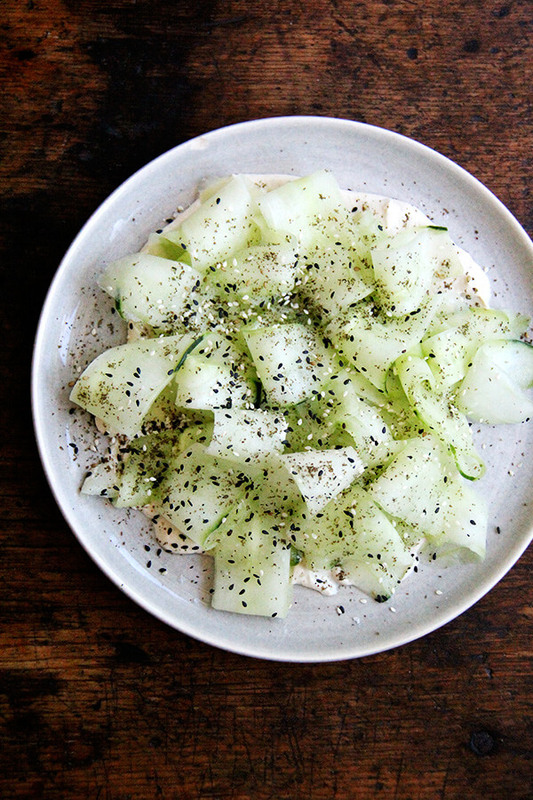 Love the idea of peas and cucumbers. Yum! I buy these kinds of salad at my local deli. It’s time I just do it myself—-just like the Little Red Hen. I haven’t gotten in the habit of having quinoa in my pantry is part of the reason. The rest is middle age forgetfulness to purchase it. Sigh. But with such a healthy salad I am sure I would sharpen my memory–ya think? 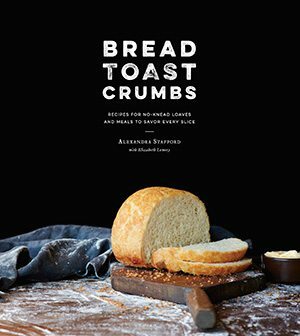 Hi Alexandra- this looks delicious! 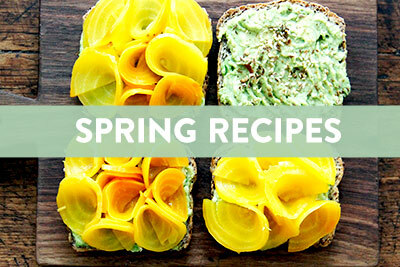 Can’t wait to add it to my lunch repertoire for spring. Thanks, Phoebe! I think this same combo would be really good with quinoa and maybe a little millet? I love millet. Made this tonight! 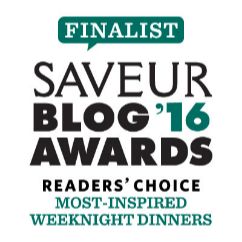 Superb–and very light even though one might think wheat berries are heavy. 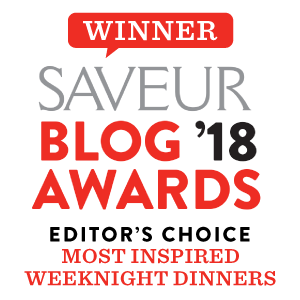 Wonderful combination of flavors and textures and the white balsamic vinegar is mellow and flavorful and not at all cloying as regular balsamic can be. A great combination and sure to be a staple. I love the trick of roasting the nuts and rubbing off the skins in a tea towel. 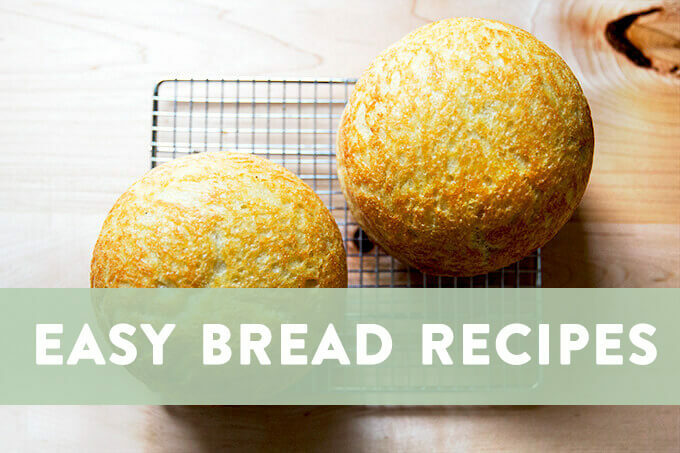 it is a little extra step–but not a big one at all and really yields more flavor. A meal in itself for four people. As virtuous as tofu but much tastier. So happy to hear this, Liz! 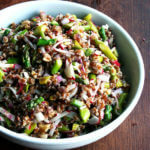 Made using Quinoa and used sliced almonds instead of walnuts (allergy issues) AMAZING! First time cooking with the stuff. A keeper, already thinking of different combinations following your method. Thanks again Ali. Oh and also made the naan dough, ready to go with my husband’s famous chicken curry tonight. Yay! I am so happy to hear this, Laura! I am hosting a baby shower in early May, and I am going to make this using quinoa — the honoree happens to be gluten-free. So happy you approve. 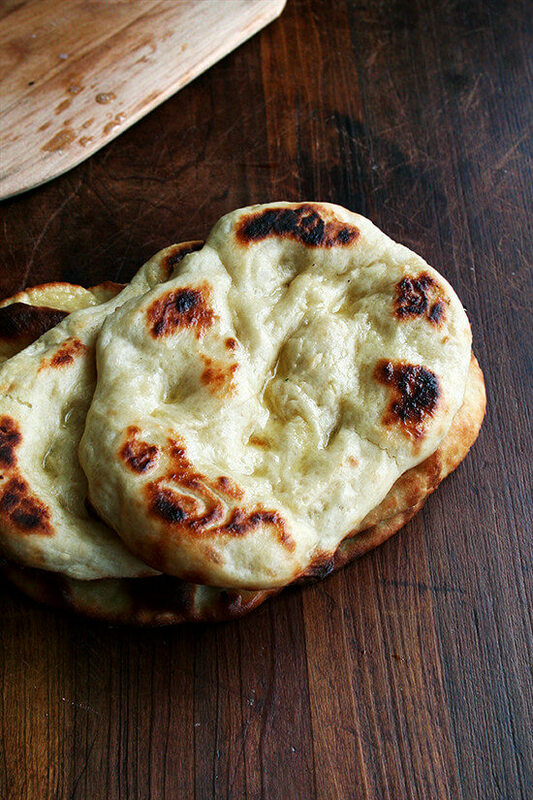 How did the naan turn out? That dough can be a little tricky sometimes. And I think I need to know more about your husband’s curry. I LOVE curry. Hope you are well! This made such a delicious meal. Understated and very fresh! Loved it! Yay! Wonderful to hear this. 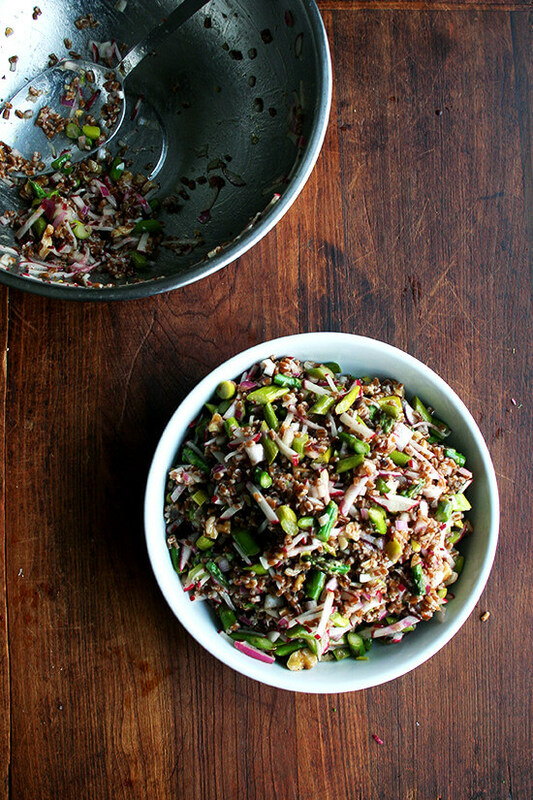 I could eat these grain salads all summer long. So glad you approve. — I used 1c uncooked wheat berries, which turned into about 2-ish cups post-cooking. Based on my bowl & your pictures, I believe this is right but would love it you could confirm. — As I made it here, I thought 1/3c oil was a lot – my salad was a fair bit oilier than I would like. Next time I make it I will definitely cut back, maybe to 2T or so. — Do you frequently use dried pepper flakes for spice in this, or more often fresh? I used dried aleppo chili flakes, which I use in a lot of things & really like, but didn’t feel like they were as spicy here as I would have thought. Perhaps it will get spicier in the fridge. Hi Gabby! Thanks so much for these comments. I haven’t cooked wheat berries recently, but 2 cups of cooked wheat berries for 1 cup dried seems about right. I feel like I maybe get a little bit more, but I will have to measure this the next time I make them. I could definitely see 1/3 cup being too much oil, and I should make a note. For whatever reason, 1/3 cup is what I always do for 1 cup of dried grains no matter the grain, but I’m guessing certain grains absorb oil differently, and perhaps wheat berries don’t soak it up as well as say quinoa. Also, it is so easy to add more oil if necessary but not so easy to take it away. Thanks for this comment. I almost always use dried red pepper flakes, but in the summer, I will use a jalapeno or serrano or whatever I have on hand. Sometimes I’ll use both. I have dried piment d’espelette but I find that never to be as spicy as the pepper flakes either. Did it get spicier in the fridge?